As if the feral pig expansion throughout the southern part of the United States wasn't enough, now Burmese pythons may be expanding their range in Florida. Burmese pythons have expanded their range from the Everglades, where they first were found in the 1980s. It's unknown exactly how the snakes, which can grow to 23 feet long and up to 200 pounds. The snake can grow from a hatchling to 8 feet in a year, given the right habitat and food sources. To compound the issue, researchers have discovered Indian python genes in Burmese pythons captured and studied. The Indian python is more tolerant of colder climates unlike those in the Everglades and south Florida. 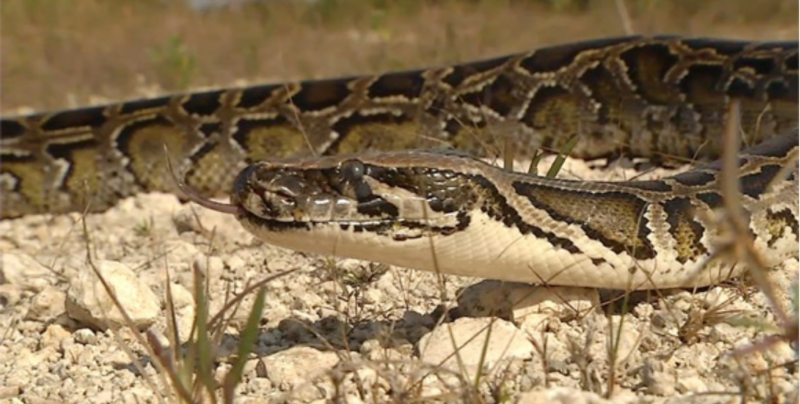 “We set out to investigate the Burmese python in the Everglades to help provide information for management and conservation agencies … we found 13 of the 400 snakes that we analyzed had portions of Indian python within their genome,” said Margaret Hunter, a USGS geneticist and the lead author of a study by the U.S. Geological Survey (USGS) in the journal Ecology and Evolution. The researchers, according to the journal report, said the pythons will become more of a problem. Not could or maybe, but will become a problem. That's not good news. Hunter said the Burmese pythons, could, with the Indian python genes, adapt more easily and expand their range. “This might allow this population to expand into drier environments … maybe further to the north or outside of the Everglades … where the population is right now,” she said. In the Everglades and south Florida area where the pythons now live, thanks to the marshy habitat it's difficult for hunters or anyone to control or eradicat them. Researchers say the pythons are so stealthy they may even be nearby when a human is approaching or standing near, opting to remain in place and well hidden thanks to their camouflage without being detected. As with any predator, the pythons go after the lowest-hanging fruit in the forage world, too. That includes rabbits, rats, raccoons, opossums, birds, small alligators or whatever else they can bite and then suffocate with their powerful, constricting muscles. Whitetail deer even have been found in some larger pythons. In their natural range overseas, reports occasionally surface of pythons attacking and killing humans. — Can grow up to 20 feet in length. — Average size removed in Florida: 8-10 feet. — Native to South Asia. — Females lay about 50-100 eggs per year. — Can live past 20 years in captivity. — Skin pattern provides effective camouflage in landscape, making snakes difficult to see. — “Sit and wait” predators that prey on birds, mammals and reptiles. — In Florida they can no longer be acquired as personal pets. — Federal law prohibits transport across state lines or import into the country without a federal permit.